Our ultra rich body butter contains hydrating volumes of natural plant oils and vegetable glycerin blended with antioxidant Vitamins A and E to maximise skin health. This is a rich, non greasy body butter which is really great for feeding dry skin. Manuka Honey has a ‘Unique Manuka Factor’ (UMF) which refers to its level of non-peroxide antibacterial activity. This factor provides an additional potent anti-bacterial action on top of the usual antibacterial abilities of all honeys. It has also been shown to diffuse deeper into skin tissues. Manuka Honey is tested for its level of non-peroxide activity and issued with a number. So a rating of 10 indicates the same level of antiseptic potency of a 10% solution of Phenol (Carbolic Disinfectant). The higher the rating, the higher the activity level is, and therefore the greater the healing ability. 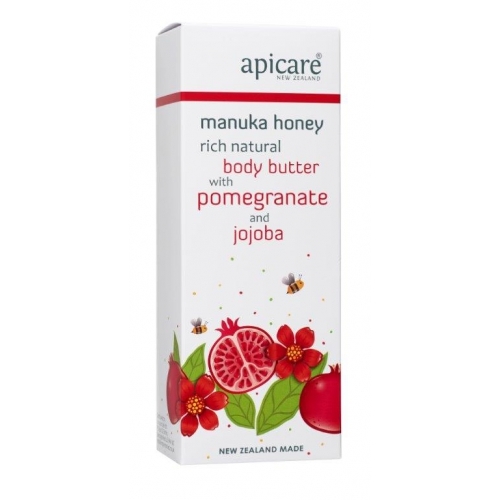 This luxurious body butter is rich in New Zealand Manuka honey and Shea butter from the African Karite tree. Contains hydrating volumes of natural plant oils and vegetable glycerin blended with antioxidant Vitamins A and E to maximise skin health. This is a rich, non greasy body butter which is really great for dry skin.